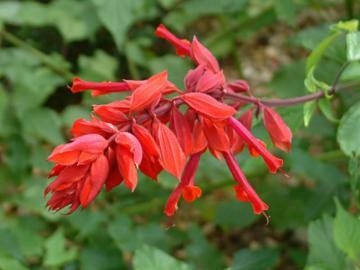 Large drooping spikes of vivid bright red, tubular flowers and deep wine-red calyces. Late flowering. Strong, erect, shrubby growth habit, usually grown as an annual but perennial in warm climates. Fertile, well drained, neutral to acid soil in sun or part shade. Frost tender and performs best in fairly warm conditions. Bedding schemes or in mixed borders.